SOUTH PASADENA >> A routine traffic early Saturday led to the arrest of a man driving a stolen car through South Pasadena, along with drugs, burglary tools and an outstanding warrant for auto theft, police said. The arrest took place about 1 a.m. after an officer pulled over a 2017 Nissan Rogue SUV for a traffic violation at Mission Street and Fairview Avenue, South Pasadena police Sgt. Spencer Louie said. The vehicle was equipped with paper license plates, but when the officer ran the SUV’s vehicle identification number, he learned it had been reported stolen in South Pasadena in late-June, according to the sergeant. Police took the driver into custody without a struggle and also discovered a small amount of methamphetamine and burglary tools inside the stolen SUB, Spencer said. Additionally, the man had an outstanding warrant related to an auto theft case. 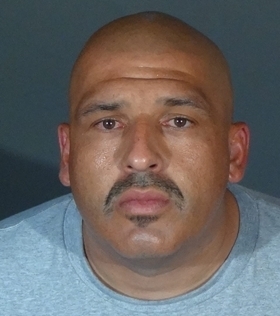 Joel Ramirez, 26, of Los Angeles was booked on suspicion of auto theft, possession of burglary tools and possession of methamphetamine, and was also being held in connection with his warrant, Louie said. According to Los Angeles County Superior Court and booking records, Ramirez pleaded “no contest” on March 3 to a charge of taking a car without the owner’s consent, stemming from an arrest two days earlier . He was sentenced to 120 days in county jail and three years of formal probation. He served three weeks in jail before being released on March 23. More recently, in May, he was convicted of methamphetamine possession, records show. He was sentenced to 30 days in jail and three years of summary probation. He was released after serving seven days. Ramirez criminal history also includes convictions for possession of methamphetamine and possession of drug paraphernalia in 2017; two counts of taking a car without the owner’s consent, petty theft, and methamphetamine possession in 2016; two counts of methamphetamine possession, possession of a switchblade knife and possession of drug paraphernalia in 2015; and violating a restraining order in 2014. Ramirez was being held without bail pending his initial court appearance, scheduled Tuesday in the Alhambra branch of Los Angeles County Superior Court. PASADENA >> Police are seeking a pickup truck belonging to a reserve police officer, which containing a handgun, ammunition, body armor and other equipment, that was stolen in Pasadena on Wednesday, officials said. The truck theft took place between 4:15 p.m. and 6:15 p.m. in the 1100 block of Rosemont Avenue, Pasadena police officials said in a written statement. The vehicle, owned by a Pasadena Police Department reserve police officer, contained a semi-automatic handgun and other law enforcement equipment, to include a duty belt (no radio), ballistic helmet, ballistic vest, gas mask and ammunition,” according to the statement. 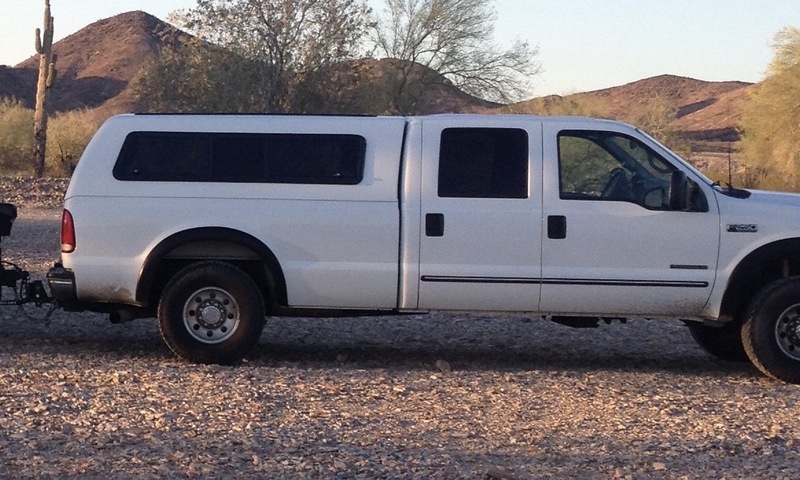 Police described the missing truck as a white, 2000 Ford F-250 crew cab pickup truck with a matching camper shell and California license plate number 6J54905. Anyone with information is asked to contact the Pasadena Police Department at 626-744-4241. Tips may also be submitted anonymously to L.A. Regional Crime Stoppers at 800-222-8477. AZUSA >> Police in Azusa arrested an auto theft suspect Wednesday morning after he jumped from the still-moving vehicle and tried to make his escape on foot, authorities said. 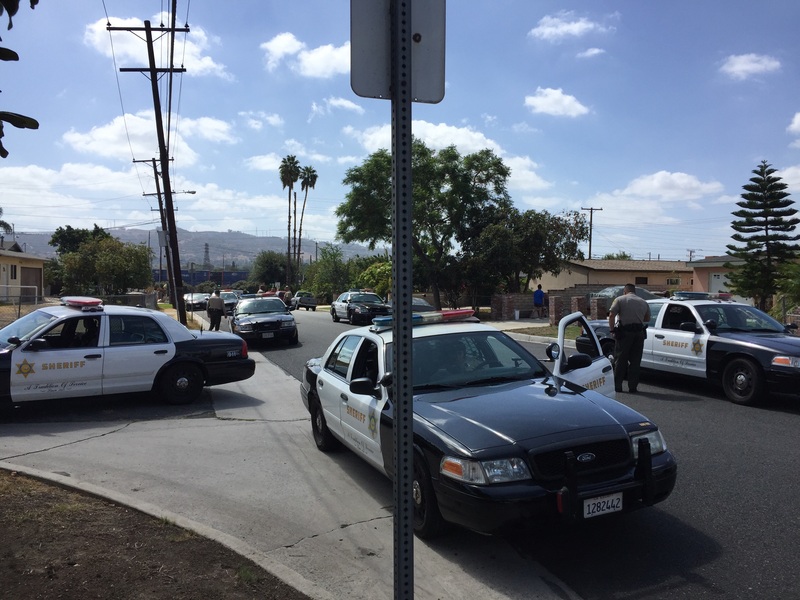 The incident began about 10 a.m. when an officer on patrol near Citrus Avenue and Basline Road spotted a passing car that had been reported stolen in Ontario earlier in the morning, Azusa police Sgt. Xavier Torres said. The abandoned stolen car continued until it went up onto a sidewalk and came to a stop in a residential front yard, Torres said. The driver ran through several backyards before they found and arrested the suspect hiding in a nearby yard with help from alert neighbors and a Los Angeles County Sheriff’s Department helicopter, Torres said. The suspect, whose name was not available Wednesday afternoon, was booked on suspicion of auto theft and resisting arrest, police said. He was expected to be held in lieu of $25,000 bail pending his initial court appearance, scheduled Tuesday in West Covina Superior Court. PASADENA >> Police arrested a man and teen following a brief pursuit in a stolen car, as well as the man’s brother, who they say interfered with the arrest on Friday, officials said. Jose Ibarra, 19, of Pasadena and a teenage boy were booked on suspicion of auto theft, while Ibarra’s brother, Rafael Ibarra, was accused of resisting police with violence and resisting or obstructing police, Pasadena police Lt. Pete Hettema said. The incident began about 1:25 p.m. when patrol officers received a notification from an automated license plate reader that a Ford Escape driving in the area of Penn Street and Garfield Avenue had been reported stolen, Pasadena police Lt. Pete Hettema said. The driver, later identified as Jose Ibarra, refused to pull over, initiating a chase, he said. The teenage passenger got out of the car and ran in the area of Howard Street and Fair Oaks Avenue, but was soon captured, the lieutenant said. The driver of the Ford Escape continued until he reached Navarro Avenue, just south of Howard Street, where he pulled over near his home, Hettema said. As officers took the driver into custody, his older brother came outside and interfered with the arrest, Hettema said. Rafael Ibarra scuffled with officers before being arrested on suspicion of resisting police with violence and resisting or obstructing police. He was treated for a minor injury suffered in the scuffle before being booked into jail. According to county booking records, Jose Ibarra was being held in lieu of $75,000 pending his initial court appearance, while Rafael Ibarra was being held in lieu of $51,000 bail. BALDWIN PARK >> Two men chased down a big rig to Irwindale after it was stolen in Baldwin Park Wednesday, but the thief escaped with the help of a knife-wielding accomplice who spirited him away in a getaway car, officials said. The chain of events began about 11:50 a.m. with the report of a big rig being stolen in the 15200 block of Arrow Highway, just west of Azusa Canyon Road, Baldwin Park police Sgt. Joshua Hendricks said. A co-owner of the truck and a man in his friend, both men in their 20s, saw the truck drive off, he said. They called police and followed behind the stolen big rig in another car. The truck became stuck in traffic on Irwindale Avenue at the 210 Freeway in Irwindale, officials said. The driver of the just-stolen big rig reversed the truck and rammed his pursuers. No injuries were reported, and the damage to the car was described as minor. The victims exited their car and tried to grab the truck thief, but an accomplice showed up and brandished a knife before both suspects fled in a gray BMW sedan, Hendricks said. The investigation was being handled by Irwindale police, Hendricks said. Irwindale police Sgt. Rene Sapien declined to discuss the case, referring inquiries back to Baldwin Park police. VIDEO: Do you recognize these Azusa auto theft suspects? 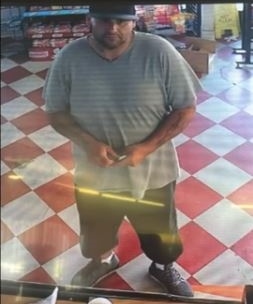 AZUSA >> Police are seeking the public’s help in tracking down a man and woman who they say stole a car from outside of an Azusa business last week. The auto theft took place about 12:40 p.m. on Aug. 25 in the 200 block of East Newburgh Street, Azusa police said in a written statement. The suspects’ images, as well as the theft, were captured by surveillance cameras at an adjacent business. Sgt. John Madaloni said the suspects snatched the car keys from inside a business before fleeing in the victim’s car. The footage shows two people chasing after the car to no avail as the suspects drive it away. The male thief was described as a heavy-set Latino man of about 30 years old, with dark hair and tattoos on both arms and around his neckline. The word “circle” was tattooed on his left arm, along with a tattoo of an apple under his left elbow. He had a mustache and goatee and wore a light-colored shirt, long dark shorts and a dark baseball cap. His female accomplice was described as a Latina woman in her late-20s or early-30s, with dark hair, possibly in a pony tail. She wore glasses, a dark shirt and dark pants. Anyone with information is asked to contact Azusa police at 626-812-3200 regarding case 16-33232.